Incorporating vegetables such as courgettes, carrots, beetroot and squash into cakes can be seen as a gimmick, a way to use up a glut, or a way to get children to eat vegetables. But it also does wonders for the cake, helping to keep it moist. Cakes made with veg definitely keep for longer in my experience and also have a satisfying fudgy texture rather than being dry and crumby. Your choice of veg will make a difference. I’ve made Nigel Slater’s beetroot chocolate cake a few times and the beetroot adds richness and an earthy tang (as well as making the cake a glorious oxblood colour). The flesh of a pumpkin or squash will give it a fruity sweetness. Courgette is the one that will add little in the way of flavour of its own. A single cake will happily absorb a large courgette, indeed one that has passed the point of being a true courgette and is well on its way to being a marrow. This is my chocolate courgette recipe. In writing it out, I’ve surprised myself slightly with just how long the ingredients list is, but I do put it together as simply as possible: mix the dry ingredients, mix the wet ingredients, blend the two, and bake. 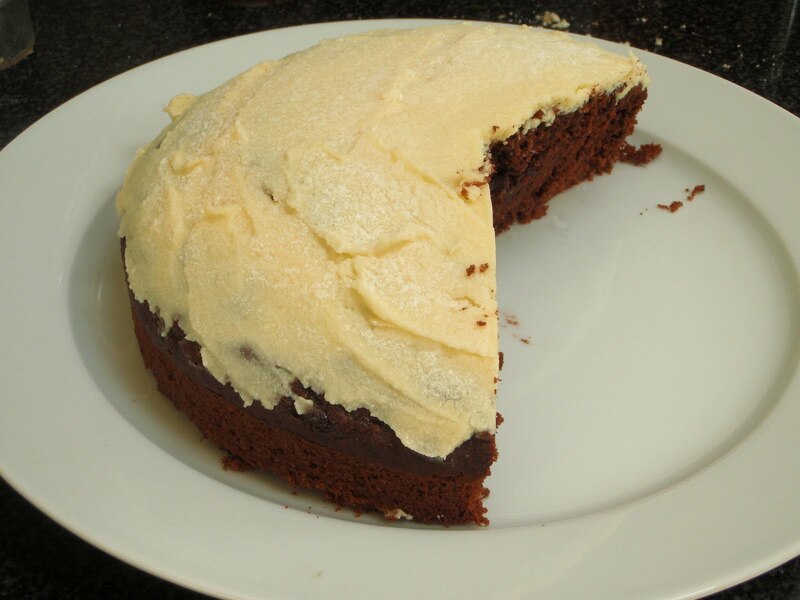 The white chocolate icing is very quick and easy to make – which is necessary because the hordes will be clamouring to eat the cake from the minute it comes out of the oven. You want an icing that can be whipped up and slapped on as soon as the cake is cool enough. Pre-heat the oven to 160 degrees. Grease a 24cm cake tin. Sieve the dry ingredients into a large bowl. Top and tail and peel the courgette, then grate it into the bowl of a food processor. I get good results by using the processor's fine grating disc, which pulps the courgette into a wet slurry. Add the eggs, sugar, oil and coffee to the grated courgette in the processor bowl and whizz up until blended and smooth – it will be a very unappetising greeny-grey colour and soupy. Pour the courgette slurry into the bowl with the dry ingredients and mix quickly and roughly with a metal spoon. Add the almonds at this point, if using – they will add to the fudgy texture of the cake, but I've made the cake successfully without them. Spoon the mix into the cake tin and bake in the centre of the oven for 40 minutes. Test if the cake is ready by plunging a skewer into the centre: if it comes out clean or without liquid clinging to it, it’s done. Let the cake settle for 10 minutes or so, then turn out of the tin and cool on a rack. Make the icing by melting a 200g bar of white chocolate either in the microwave or in a bowl suspended over boiling water. Add 50g unsalted butter, remove from the heat, and beat until melted and smooth. Now add icing sugar, a little at a time, to bulk and firm the mixture up. Once you have a mix that is spreadable but not sloppy, smooth it over the top of the cake with a palette knife. Sieve a little icing sugar over the top, like snow, to disguise any lumps and bumps. What is happening with my tomatoes? 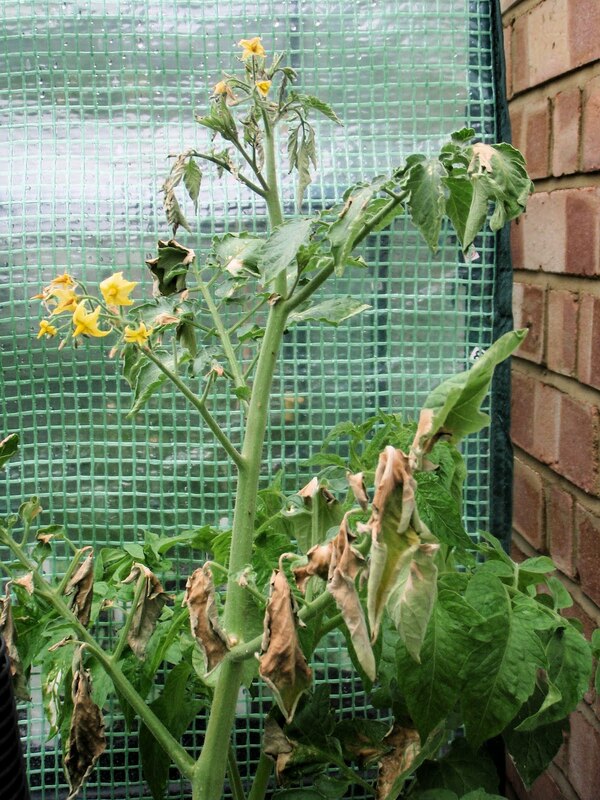 Brown patches on the leaves, wilted tops that don't revive with watering. Only half the plants are affected: those in pots outside. 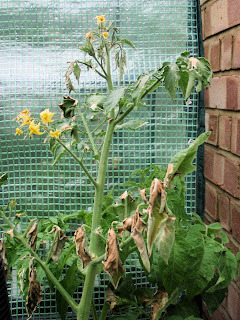 A look through Dr D G Hessayon's Vegetable & Herb Expert suggests it's a root rot, caused by poor drainage, which could fit in with the massive deluges of rain we got last month after the dry spell. There doesn't seem to be a cure, apart from mulching around the stems to encourage new root growth. Any ideas? Hope fully the plants won't keel over completely and we'll get a crop of some kind.